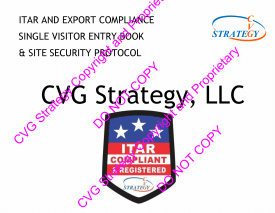 The ITAR Visitor Single Entry Book is used to enable convenient record-keeping of visitors to offices or any facility with the security of a single page per visitor to protect visitor identity from future visitors. Have questions about our earth-friendly ITAR Badges and Visitor Register? We have answers! Why is an earth friendly ITAR Visitor Register a good choice? With your onsite security, identifying your visitors as US Persons or Non-US Persons along with having a register of your visitors is a critical component to keeping your company safe from suffering a deemed export violation. This earth friendly ITAR Visitor Register is made from 100% recycled paper!